IMCDb.org: 1905 Dürkopp London bus in "London - The Modern Babylon, 2012"
It is possible from the registration sequence that this may, and I emphasize the may, be a Great Western Railway Road Cars bus, and further that it may be a 1906 or thereabouts Maudslay. The low position of the engine, the chassis member crossing in front of the radiator, the shape of the hubs on the front wheels, and the track rod passing to arms in front of the axle are similar to a photograph I have of an SMT Maudslay taken at Penicuik and registered S 550. It is certainly not an LGOC "B" Type, nor does it resemble the Milnes-Daimlers or Straker-Squires run by the LGOC. If anyone knows for sure that this speculation is incorrect, I should be pleased to be told! Does this help or confuse - /vehicle.php?id=667801 ?? The bus in the other pic is quite different to this one. Were there other companies running buses in London at this time other than LGOC? I see a list included here - http://en.wikipedia.org/wiki/GWR_road_motor_services - of bus makes used by GWR. Maybe of some use?? Having looked at the link provided in greater detail, I now see that the GWR didn't provide bus services in London. 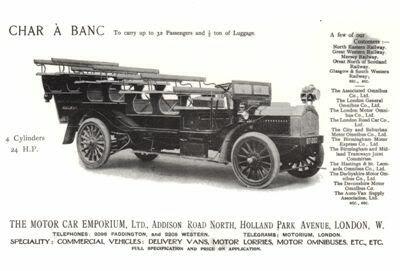 There were quite a lot of firms apart from LGOC who ran buses in the metropolis, however by about 1920 the General had bought most of them with two of the exceptions being Thomas Tilling and Birch Brothers. I believe there could be a Durkopp connection. The Saurer chassis with Liversidge bus body built by J and E Hall I found looks similar and appears in the link ^ as "1907 Dürkopp-Hallford-Saurer-Liversidge Double-decker Bus". Unable to find any other pictures of 1907 Dürkopp-Hallford-Saurer buses in London. However I believe the radiator bonnet shape and low bulkhead with rounded corners point to it being a "Hallford-Saurer" chassis. J. and E. Hall, Limited, of the Dartford Ironworks, Kent, built lorries and buses based on Saurer designs and patents. There seems to be a scarcity of information about such early times available. I have read a two part article in "Classic Bus" concerning the commencement of bus services in Weymouth by the GWR, using Milnes-Daimler buses, the bodywork of which may well have come from the Hadley Castle Works, later owned by Sankey, then GKN. Apart from that and something about a fatal crash on the London to Brighton road in the early 1900s that's about all I can find. The Liversidge body shown above is somewhat of a coincidence, as GKN Defence took over Glover Webb (and Liversidge) and I worked at the Hamble plant for some while as Commercial Manager of one of the joint projects. I'm wondering about a rough date for the picture, which has far more horsey things visible (including a "bus") than motorised which is similar scenario to this 1907+ dated sequence which has 6 non-motorised and only one car during the full clip in this film. LC plate series started in May 1905 - was assigned for London County - and completed well before 1929 when Glass's listings start; a book source says it was issued to public and private users. This bus has 2321 registration so there were already a couple of thousand chugging things in London. Anyone any idea how long this transitional co-existence from legs to wheels lasted? The last London horsebus was approximately 1914, the horses were required elsewhere. Horse and cart transport was well used right into the 1950s, our milkman had a quite large horse and four wheeled cart, the coalman used a very large horse to drag about two tons of coal up the rise from the station sidings coalyard, and the greengrocer had a pony and trap for when he couldn't start his late 1920s Austin 20 which was a car converted into a van. This was in a market town until about 1955, when the milkman got a Bedford CA, the coal merchant began to use his Bedford which was then about 20 years old, and the greengrocer bought a new Morris-Commercial J-type. 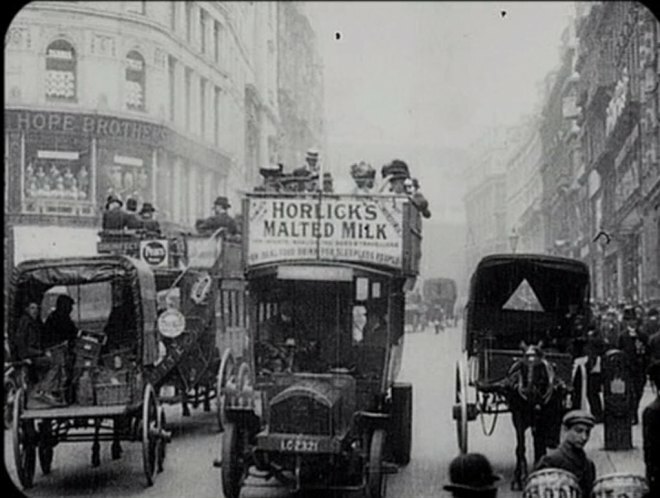 dsl wrote I'm wondering about a rough date for the picture, which has far more horsey things visible (including a "bus") than motorised which is similar scenario to this 1907+ dated sequence which has 6 non-motorised and only one car during the full clip in this film. The only other indication apart from horse transport I think is the number of motorised taxis. In 1906 there were less than 100 motor cabs in London, eight years later by the outbreak of WWI they were starting to be as numerous as the horse-drawn cab. My guess is this is pre-WWI say about 1910. ^ That oldclassiccar.co.uk source looks useful. So 1905 plate date here? There are some errors in the oldclassiccar reference which may cause problems. As far as I am concerned, the only trustworthy source of registration dates is "A history of motor vehicle registration in the United Kingdom" by the late L H Newall. I neither use nor trust anything else. According to this, LC commenced in May 1905, following the completion of "A" and was used for all classes of vehicle, whereas some later blocks were segregated between motor cycles, cars and vans, and heavy motor cars. LC completed in November 1906, to be followed by LN, then LB, LD, LA, then LE and so on as the alphabet dictates. The plates on LGOC vehicles may not follow the conventions. The first two Milnes-Daimlers used from June 1905 in Weymouth were LC1171 and LC1172, Milnes-Daimlers were a derivative of the German Daimler, assembled and bodied at Hadley Castle Works (now part of Telford) Shropshire, by Birkenhead tramcar manufacturer G. F. Milnes and Company. Production commenced in 1902, and designs were subjected to continuous improvement. This information from "GWR Buses in Weymouth" Brian Jackson, Classic Bus issues 78 and 79.
johnfromStaffs wrote "A history of motor vehicle registration in the United Kingdom" L H Newall. Thanks for the heads-up - I've just ordered a copy now! My main source is GLASS'S INDEX OF REGISTRATION NUMBERS 1929-65 - a collation of the various annual guides for that period. Has some pre-1929 info, but only for series which started earlier and finished after 1929. Not easy to find, but ebay can throw up copies occasionally - sometimes cheap. There's also a seller who's digitised it onto CD-Rom for a fiver + postage. Interesting that after the completion of A 1234 and the LC series, by late 1906 there could have been anything up to 20,000 chugging things on London streets - more than I expected given how many horsey things were also around. Not everything is there, because some of the date information has been binned by dunderheaded local authorities. It is not a book that you can sit down and read like a novel, but the amount of information contained within it is staggering. 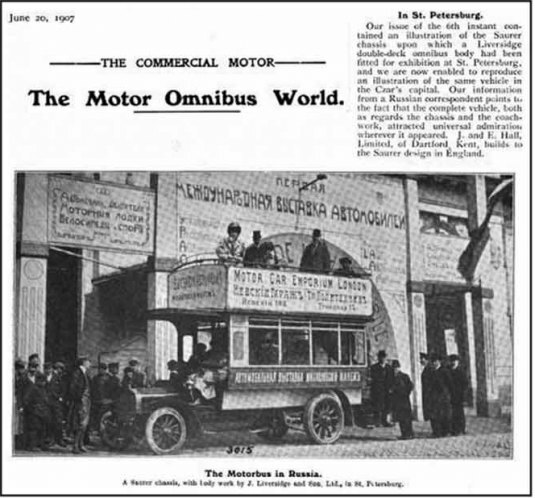 In 1905-6, according to the "Commercial Motor", 24 Dürkopp buses were operating in London at this time. 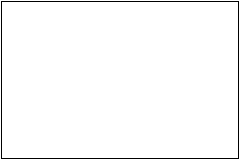 edit double deck version confirmed in the following text. 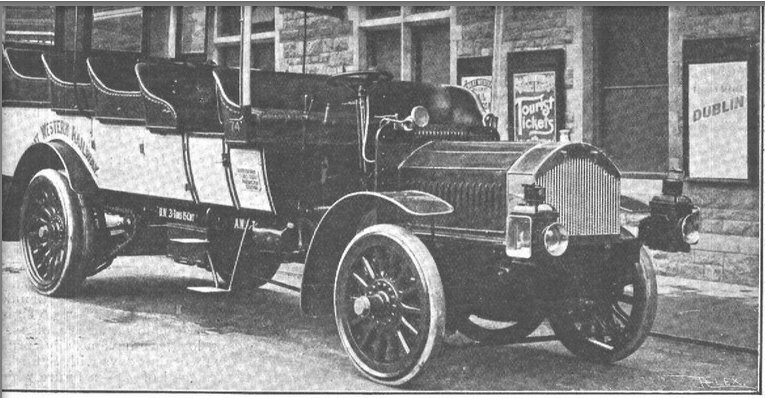 "The Dürkopp vehicle exhibited has a chassis of the type which has now been imported for several years, with the necessary improvements that experience has suggested. 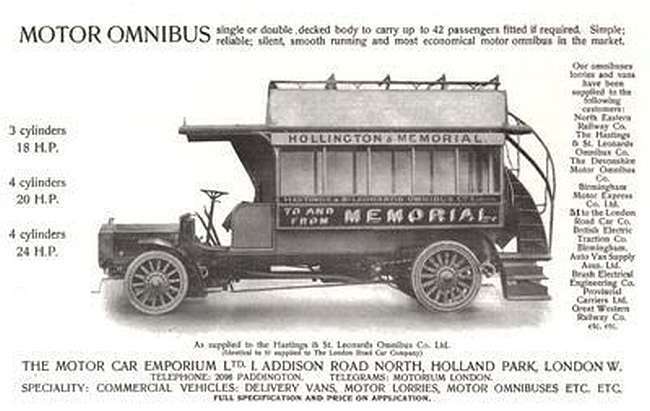 It will be remembered that this was the first type of double deck petrol omnibus to be employed by the London companies, and these chassis are still running in regular service, doing excellent work." We may now all rest easily in our beds. Owned by the London Road Car Company.